People’s number one priority in life is to maintain a healthy lifestyle. The best way to do this is by learning how to consume healthy food and exercise properly. One of the best exercises that a person can do is jogging. It is easy to pick up and doesn’t require much in the way of experience. Still, a lot of people just can’t seem to create a good running routine nowadays. Well if you’re one of those type of people, than we have the perfect app for you today. 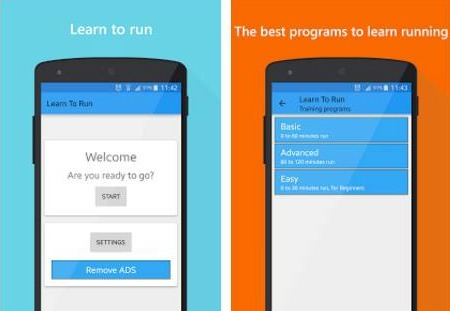 The Learn to Run app is a free Android app that acts like your own personal running helper. It is a very handy app that has tons of cool features in it. For example, if you want to listen to your favorite music while running, you don’t need to use another app in order to do that. All you have to do is use the app’s own music player. It has three difficult levels: easy, basic and advanced. It also has a neat timer that helps you stay on top of time. The app has a great interface design and minimalistic graphics that don’t take too much attention away from jogging. The app is completely free to download and install, and can be found on Google Play.